(If I am not mistaken, this is 12:00 Midnight EST in Montreal and in Cancun, 11:00 PM in Mexico City, 10:00 PM in Calgary). We invite you to connect to this page EVERY SATURDAY NIGHT (for North America - Saturday morning for India) at the aforementioned time to chant with Amma. INSTRUCTIONS: When the clock hits 10:30 am IST on Saturday, simply activate the video above and follow along with the Gayatri Maha Mantra, knowing that Amma is chanting with us. Feel her presence in communication with all of her children. If you are using the Insight Timer meditation app, you can use it for Gayatri Mantra as well: simply set meditation time to 45 minutes - and meet all devotees meditating at the same time in the app. Pls note: This is not a live event with Amma. We will simply connect to the YouTube video at the same time as Amma begins chanting to connect with her and be with her and the entire community of devotees at this most auspicious time. 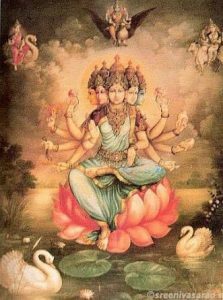 ALTERNATIVELY, as this may be a bit late for EST timezoners, may I suggest we repeat the Gayatri Mantra group chanting every Sunday evening at 8:00 PM EST (this is 8:00 PM EST in Montreal and in Cancun, 7:00 PM in Mexico City, 6:00 PM in Calgary). In case you have plans to travel to Gudda Ashram Bengalaru India in December, please refer to the program below. As you are aware Dashadinotsava is Gudda’s most awaited annual event which is an opportunity for our fulfillment. This year Dashadinotsava is even more special as “ Her Divine Grace Gurumaatha Amma “ will be focusing on multidimensional aspects of Gayatri Maha Mantra. Participants can look forward to know, learn & experience an in-depth study of Gayatri mantra with scientific contents, meaning & pervasiveness. Gayatri maha mantra is a condensed form & contains the ancient veda’s absolute knowledge. Regular Worship of gayatri builds up the immune system developed by the sun within (savitru Shakti) Immune system gets strengthened when gayatri is chanted & awakens every being to work actively, vigorously maintaining the regulation of the human system by converting the air breathed into vital energy ( prana) regularising digestive , curative & regenerative system. Participants will also be taught Yogaasana, Pranayama relating to gayatri japa. 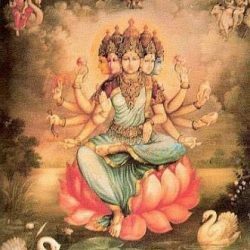 The significance of saavitri shakti, the sun energy in gaayatri worship & importance of Saatwik food. The 10 day program schedule is as below. This entry was posted in Canada blog, Videos. Bookmark the permalink.